What: This project will characterize, compare, and/or contrast the protoliths, the grade and time of metamorphism, and the intensity and age of tectonism of three rock suites found in the southern Gravelly Range and Raynolds Pass area of southwest Montana. 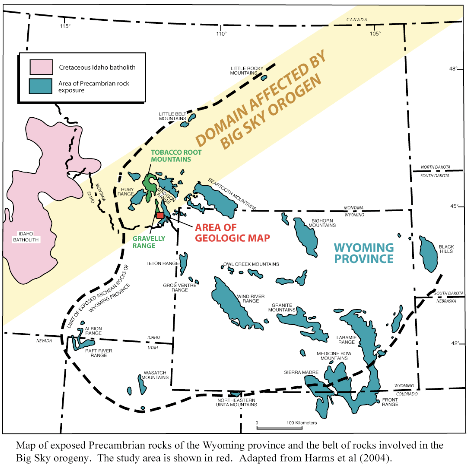 Our goal is to integrate these findings into our developing understanding of the Big Sky orogeny, an arc-continent collision that occurred along the northern flank of the Wyoming province at 1.8-1.7 Ga.
Where: The project will be headquartered in the vicinity of Island Park, Idaho. Fieldwork will be conducted in the southern Gravelly Range and adjacent Raynolds Pass area. The field area is 30 km west of Yellowstone National Park and 120 km south of Butte, Montana. Precambrian rocks in the Tobacco Root Mountains preserve evidence of a P-T-t path of metamorphism and deformation that are the result of an arc-continent collision, the Big Sky orogeny, which occurred along the NW boundary of the Wyoming Province during the Middle Proterozoic (1.7-1.8 Ga) (Brady et al., 2004). 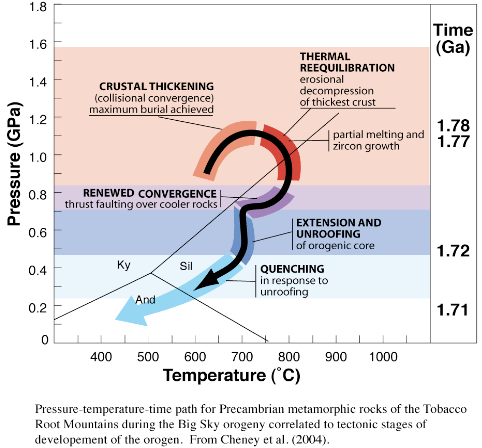 The pressures and temperatures determined indicate that Tobacco Root Mountains rock suites were first buried by some 30 km of tectonic overburden, then carried in a thrust sheet up over cooler rocks, and somewhat later experienced rapid tectonic unroofing to approximately 12 km depth. The tectonic overburden once covering the Tobacco Root Mountains must have been displaced laterally by normal faulting; similarly the crust the Tobacco Root Mountains rocks were thrust over must somewhere flank the range across a major thrust fault. Thus we have testable hypotheses about the likely tectonic history of Precambrian rock suites in the ranges surrounding the Tobacco Root Mountains. The north-south trending Gravelly Range provides a geologic transect across the inboard flank of the Big Sky orogen. Rocks in the central and Gravelly Range contrast in protolith, metamorphic grade, and thermochronology versus those in the Tobacco Root Mountains, suggesting that the Gravelly Range preserves a higher structural level or different tectonic province of the Big Sky orogen (Harms, Brady and Cheney, 2006). Three main rock suites occur in the southern Gravelly Range, including the area around Raynolds Pass (O’Neill and Christiansen, 2004). Low grade metasedimentary rocks are intruded by gabbroic bodies with contact metamorphic aureoles in the area around Standard Creek in the southern Gravelly Range. Higher grade metasedimentary rocks and interlayered metamafic rocks occur farther south between the Madison River and Henry’s Lake. A broad zone of mylonitic rocks separates the two metasedimentary suites. Field studies focused on these three rock suites will seek to relate southern Gravelly Range geology to the geology of the Tobacco Root Mountains and to the history and architecture of the Big Sky orogen. Petrology, regional thermobarometry, and PT evolution of metamorphic rocks in the two metasedimentary rock suites and of contact metamorphic rocks in aureoles. Major, trace element, and/or isotope geochemistry of metamafic units to characterize protoliths. Monazite Pb/Pb and/or amphibole, biotite, and muscovite Ar/Ar geochronology of the metamorphic rocks. Kinematics of the mylonitic zone that juxtaposes the two suites of metasedimentary rocks. Daily traverses will be largely off-road and off-trail within the National Forest. Each day we will drive Forest Service roads as close to our target rocks as possible – but most days will include a hike of 2 or more kilometers and/or a change in elevation of 1000 feet. We could encounter antelope, elk, and coyotes, as well as bears, rattlesnakes, and ticks. We will typically be working at some distance from a vehicle or cell phone service, but never alone. Summer weather in Montana is usually sunny and dry. Temperatures depend on elevation, however, and can range from 95 to 45 degrees. Afternoon thunderstorms are common. Exercising sensible precautions, good judgment, and appropriate respect will minimize the danger from such experiences and maximize the rewards of working in the Rocky Mountains. Having appropriate field gear is also a critical component of a safe work environment. Our base of operation will be a lodge-like setting where students will bunk in several bedrooms and share a couple of bathrooms. Full kitchen facilities will allow us to provide our own meals each day. Course work in metamorphic petrology and structural geology are necessary prerequisites for participation in this project. Experience at a field camp or in a field geology course is strongly recommended but not required. 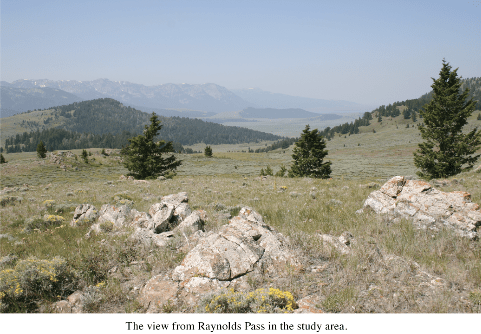 Brady, J.B., Burger, H.R., Cheney, J.T., and Harms, T.A., editors., 2004, Precambrian Geology of the Tobacco Root Mountains, Montana: Geological Society of America Special Paper 377, 256p. Harms, T.A., Brady, J.B., and Cheney, J.T., 2006, Exploring the Proterozoic Big Sky orogeny in southwest Montana: 19th Annual Keck Symposium in Geology Proceedings, p. 171-176. O’Neill, J.M., and Christiansen, R.L., 2004, Geologic map of the Hebgen Lake Quadrangle, Beaverhead, Madison, and Gallatin Counties, Montana, Park and Teton Counties, Wyoming, and Clark and Fremont Counties, Idaho: U.S.Geological Survey Scientific Investigations Map 2816, 1:100,000 scale. Betasso-a steep, lower-elevation basin where surficial deposits are of variable thickness. Students and project faculty will collect data and/or solid or liquid samples at field sites. We will work on laboratory preparation and initial sample treatment at MRS or at the extensive analytical facilities at INSTAAR in Boulder. I expect that participants will return to their home schools with field data, initial results of some laboratory measurements and samples ready for additional analysis. Data from geophysical (after post-processing) and geochemical analyses (as necessary) will probably return sometime in the fall semester. Analysis and interpretation of field and laboratory results at the home institution will be supervised by the student’s advisor and aided by the Project Director. Field mapping of “recent” erosion in Gordon Gulch using tors. Assessing the contribution of eolian material to soils in the study catchments. Important for the third year of this interdisciplinary project is a strong interest in surface and near-surface processes and in interdisciplinary science, a record of hard work and the ability to follow through. We would prefer gregarious, “can-do” students with a background in geology or physical geography and coursework in: Mineralogy and/or geochemistry Geomorphology or Quaternary geology or hydrology Sedimentology and/or soils (valuable) Field mapping, structural geology, geophysics or (valuable) GIS or a strong background in supporting science (useful). What: The 2010 Mongolia Keck project is designed to improve our understanding of the dynamics of crustal deformation associated with convergent to extensional transition zones by studying the coupling between atmospheric, Earth surface, and lithospheric processes across Quaternary time scales within the active Lake Hovsgol intracontinental rift zone of northern Mongolia. This project will integrate field studies of active faults, timing and extent of late Pleistocene glaciations, lake level history, and the paleoenvironmental ecology of the northern Hovsgol Rift zone (Figure 1). Who: Karl Wegmann (North Carolina State University), Kurt Frankel (Georgia Institute of Technology), Anne Meltzer (Lehigh University), A. Bayasaa Bayasgalan and Tsolman Amgaa (Mongolian University of Science and Technology) and 8 students. Mongolia occupies a peculiar place in Asia at the transition between a N-S convergent province to the south in the Tien Shan and an E-W to NW-SE extensional province to the north in the Baikal rift zone (e.g. Baljinnyam et al., 1993; Cunningham et al., 1996; Bayasgalan et al., 1999). Molnar and Tapponnier (1975) first suggested that post-collisional “rigid” indentation of India into Asia since ~50 Ma is responsible for Cenozoic deformation throughout the whole of Central Asia, including crustal extension in the Baikal-Hovsgol system of rifts (Fig. 2). 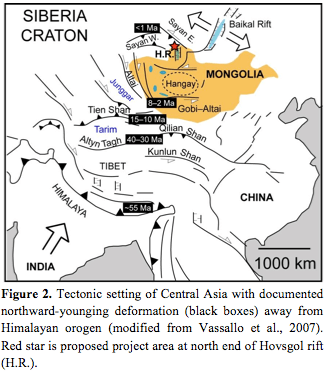 South of the Mongolian Plateau, deformation presumably related to India-Asia convergence has propagated northward since ~50 Ma, as marked by the progression in the timing of range uplift (e.g., Jolivet et al., 2001) and by movements along major strike-slip faults such as the Altyn Tagh (Fig. 2). Relative to stable Eurasia, western Mongolia and adjacent parts of central Asia (west of 100° E) currently accommodate ~10 mm/yr of northward-directed shortening related to the India-Asia collision, while the ~2000 km long Baikal rift system is presently extending at ~4 mm/yr (Calais et al., 2003). Situated in this complex juncture between regions of active shortening and extension, the Hovsgol rift [2010 Keck project] and Hangay Mountains [2006 Keck project] are broad dome-shaped areas of elevated topography and relief comprising the Mongolian Plateau. Both regions are associated with Pliocene and Quaternary volcanics and moderate heat flow (Windley and Allen, 1993). 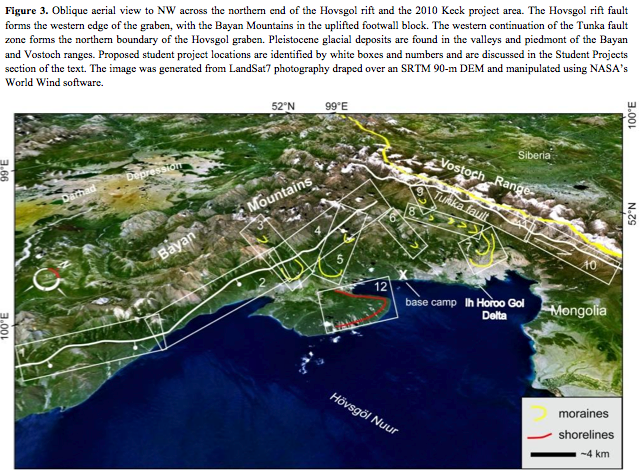 The Hovsgol rift and Hangay Mountains demarcate a kinematic transition between predominantly oblique contractions to the south and transtensional deformation to the north (Fig. 2; Baljinnyam et al., 1993). The proposed project is designed to improve our understanding of the dynamics of crustal deformation associated with oblique-contractional to transtensional transition zones in intracontinental settings and the interactions between atmospheric, Earth surface, and lithospheric processes within the active Hovsgol rift. The proposal is built around several key observations. First, rift bounding faults exhibit geomorphic evidence for recent activity, and discrepancy exists as to how far-field stresses are being transferred from the Hovsgol graben northward into the Tunka basin and southwestern Baikal rift. Second, variability in the down-valley extent of Pleistocene glaciers may reflect on-going tectonic uplift of the Bayan and Vostoch Mountains, resulting in an effective lowering of the equilibrium line altitude (ELA) between marine isotope stage (MIS) 6 and MIS 2. The opportunity now exists to develop a detailed late Quaternary chronostratigraphy for the northern Lake Hovsgol rift that will encompass glacial, fluvial, and littoral sequences anchored by high-precision radiometric age control. These terrestrial records in turn may be integrated with high-resolution paleoclimate proxy records recently retrieved from Lake Hovsgol via sediment coring by members of the International Continental Drilling Program (e.g. Hovsgol Drilling Project Members, 2009). The primary goal of the proposed research is to engage senior undergraduate-level geoscience majors in testing hypotheses via independent field research around a coupled tectonic-geomorphic problem. Cross-cultural scientific exchange is also of significant importance to our project. Furthermore, improving our understanding of the dynamics of crustal deformation associated with oblique-contractional to transtensional transition zones in intracontinental settings is one of the most important topics in modern tectonics. Specifically, it appears that the Hovsgol rift system plays an important role in the transfer of far-field strain across central Asia to the Baikal rift, accommodating a significant fraction of the intracontinental deformation related to the India-Asia collision in the process (e.g., Calais et al., 2003). Yet the lack of field-based investigations and numerical chronologies has made it difficult to assess the exact role this system plays in accommodating this deformation. Similarly, continental rift basins, like Hovsgol, preserve sediment and paleoenvironmental proxy archives of climate variability and landscape response to tectonic and climatic forcing over tens to millions of years. These lake basin records, when combined with terrestrial records of late Pleistocene glacial extent and timing provide key constraints on central Asian climate dynamics and the synchroneity (or lack thereof) of environmental change across Central Asia, the northern hemisphere, as well as between hemispheres. This Keck project is built around several key observations. First, both the Hovsgol rift-flank fault and the Tunka fault exhibit ample geomorphic evidence for late Pleistocene to Holocene activity. Geomorphic relationships suggest that the Hovsgol rift flank fault is predominantly normal. In contrast, there is much debate concerning the kinematics of the Tunka fault, with normal, reverse, and sinistral senses of shear all having been put forth as possibilities (e.g., Baljinnyam et al., 1993, McCalpin and Khromovskikh, 1995; Arjannikova et al., 2004; Vogt and Vogt, 2007). Second, the furthest downvalley moraines for glaciers heading along the western actively uplifting rift flank appear to be MIS 2 in age, whereas the furthest down-valley glacial deposits for valleys that head behind the active rift flank (e.g. Ih-Horoo valley) appear to be older than MIS 2. Collectively, these observations lead us to hypothesize that the predominantly normal rift-flank fault on the west side of Hovsgol Nuur accommodates some portion of the indentation of India into Asia. Although there is a lack of consensus as to kinematics along the western portion of the Tunka fault, given its orthogonal orientation with respect to the Hovsgol rift, it is clear that this structure must play a major role in transferring far-field stresses northward into Siberia and the Baikal rift system. Accordingly, glaciers of the LGM extended downvalley further than previous glacial advances due to on-going tectonic uplift of the Bayan and Vostoch Mountains, which resulted in an effective lowering of the equilibrium line altitude (ELA) between MIS 6 and MIS 2. Detailed mapping and geochronology of glacial deposits will help confirm or refute our hypothesis of ELA depression resulting from continued tectonic activity. We have outlined 13 potential research topics for students involved in this project to choose from (Figure 3). The projects include structural and geomorphic analysis of active faults, timing and extent of late Pleistocene glaciations, lake level history, and investigations of paleo-environment/ecology. Our goal is to have an integrated project whereby students’ individual research contributes to the broader overall understanding of the Quaternary tectonic and climatic history of the Hovsgol region. 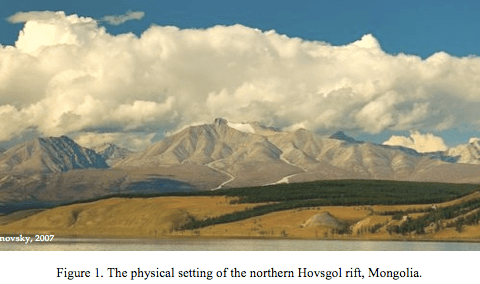 Projects 1, 2, and 4 – Hovsgol Rift Flank Normal Fault: These projects will focus upon the geometry, kinematics, age, and evolution of the rift flank normal fault bounding the western edge of Lake Hovsgol (Figure 3). Projects 3, 5, 6, 7, 8, and 9 – Timing and Extent of Late Pleistocene Glaciations: The northern Hovsgol rift is characterized by numerous glacial features including moraines and glacial deposits. These projects will focus on the number, extent, age, and climatic significance of glaciations in the Hovsgol region for comparison with similar studies in the Darhad Basin to the west (Figure 3; Gillespie et al., 2008) as well as other parts of central Asia. Projects 10 and 11 – Western Tunka Fault Zone: These projects are similar to projects 1, 2, and 4 and will focus upon the geometry, kinematics, age, and evolution of the Tunka fault, which bounds the northern end of our field area (Figure 3). Project 12 – Lake Hovsgol Shorelines: In places, evidence exists for paleo-shorelines around Lake Hovsgol (Figure 3). These shorelines can be used to determine lake level histories in addition to rates and style of tectonic activity. The student involved in this project will map and survey paleo-shorelines, including the use of differential GPS and Ground Penetrating Radar equipment to accurately determine the elevations and stratigraphic relationships of the shorelines. Project 13 – Paleoclimate Coring and Dendrochronology: The student involved in this project will collect shallow (<10 m) sediment cores from marshes and shallow glacial lakes and dendrochronology cores from the surrounding forests to investigate Holocene environmental change in the Hovsgol region. This project will require significant post-field lab analysis of paleoenvironmental proxies, such as total organic carbon, loss on ignition, pollen, and perhaps stable isotope analyses and/or dendrochronologic analysis. This project will take place in a remote location where medical attention is not readily available. Students should be prepared for all weather conditions from cold rain and snow to hot, dry, and windy. All project participants will camp for the duration of the project. Students should be in good physical condition as most of the projects will involve large amounts of off-trail hiking over steep and uneven terrain at relatively high elevations. Students should have field experience (4-6 credit Field Geology) combined with a sense of adventure. In addition, students should have completed at least two (2) of the following courses: geomorphology, structural geology, Quaternary geology, paleoclimatology, sedimentology and stratigraphy, geophysics, geodynamics, or tectonics. Courses in first aid, CPR, and wilderness medicine are also useful. Arjannikova, A., Larroque, C., Ritz, J.-F., Deverchere, J., Stephan, J. F., Arjannikova, S., and San’kov, V., 2004, Geometry and kinematics of recent deformation in the Mondy-Tunka area (south-westernmost Baikal rift zone, Mongolia-Siberia): Terra Nova, v. 16, no. 5, p. 265-272. Baljinnyam, I., Bayasgalan, A., Borisov, B. A., Cisternas, A., Dem’yanovich, M. G., Ganbaatar, L., Kochetkov, V. M., Kurushin, R. A., Molnar, P., Philip, H., and Vashchilov, Y. Y., 1993, Ruptures of major earthquakes and active deformation in Mongolia and its surroundings: Geological Society of America Memoir 181, 62 p.
Bayasgalan, A., 1999, Active Tectonics of Mongolia. Ph.D. Thesis, University of Cambridge, UK. Calais, E., Vergnolle, M., San’kov, V., Lukhnev, A., Miroshnitchenko, A., Amarjargal, S., and Déverchere, J., 2003, GPS measurements of crustal deformation in the Baikal-Mongolia area (1994-2002): Implications for current kinematics of Asia: Journal of Geophysical Research, v. 108, no. B10, 2501, doi:10.1029/2002JB002373. Cunningham, D. W., Windley, B. F., Dorjnamjaa, D., and Badamgarav, Z., 1996, A structural transect across the Mongolian Western Altai: Active transpressional mountain building in central Asia: Tectonics, v. 15, no. 1, p. 142-156. Gillespie, A. R., Burke, R. M., Komatsu, G., and Bayasgalan, A., 2008, Late Pleistocene glaciers in Darhad Basin, northern Mongolia: Quaternary Research, v. 69, no. 2, p. 169-187. Hovsgol Drilling Project Members, 2009, Sedimentary record from Lake Hovsgol, NW Mongolia: Results from the HDP-04 and HDP-06 drill cores: Quaternary International, v. 205, no. 1-2, p. 21-37. Jolivet, M., Brunel, M., Seaward, D., Xu, Z., Yang, J., Roger, F., Tapponnier, P., Malavieille, J., Arnaud, N., and Wu, C., 2001, Mesozoic and Cenozoic tectonics of the northern edge of the Tibetan plateau: fission track constraints: Tectonophysics, v. 343, p. 111-134. McCalpin, J. P., and Khromovskikh, V. S., 1995, Holocene paleoseismicity of the Tunka fault, Baikal rift, Russia: Tectonics, v. 14. Molnar, P., and Tapponnier, P., 1975, Tectonics of Asia: Consequences and implications of a continental collision: Science, v. 189, p. 419-426. Vassallo, R., Jolivet, M., Ritz, J. F., Braucher, R., Larroque, C., Sue, C., Todbileg, M., and Javkhlanbold, D., 2007, Uplift age and rates of the Gurvan Bogd system (Gobi-Altay) by apatite fission track analysis: Earth and Planetary Science Letters, v. 259, no. 3-4, p. 333-346. Vogt, H., and Vogt, T., 2007, Morphotectonic evolution of two depressions at the southern border of the Baikal rift system: Geomorphology, v. 86, no. 3-4, p. 480. The Keck project will coincide with an NSF EarthScope project being carried out in the Bighorns, so there are collaborators who will be involved in the project. These include PhD students Karen Aydinian (U. Wyoming), Will Yeck (U. Colorado); seismologists Anne Sheehan (U. Colorado) and Kate Miller (Texas A&M); and more! Quintessential geological structures in the Rocky Mountains of North America, now recognized to exist in the interior of many continents, are basement-involved foreland arches. They consist of faulted Precambrian crystalline rock forming a quasi-barrel-shaped topographic and structural culmination (the “arch”), covered by sedimentary rocks that are deformed into exceptionally lovely monoclines and anticlines at the mountain-range scale. The apparent folding of the Great Unconformity that separates crystalline basement from cover rocks presents an intriguing mechanical problem, in that the fold arch occurs at a scale that requires deformation of the entire lithosphere (not simply the crust). The Bighorns Keck project will use structural geology and seismology to examine four competing models for the lithospheric-scale structure of the Bighorns arch (see diagram, next page) and to determine the process of formation of basement arches. The work will bring fundamental new insights about the processes of deformation of strong, old lithosphere within continent interiors, distant from active plate boundaries. Students will have access to new data from an innovative passive and active source hybrid experiment designed to image the lithosphere, that will be conducted by EarthScope project seismologists during the time period of the Keck project. to merge the seismic and structural datasets into structural profiles that tie it structures exposed at the surface to structures within the Rocky Mountains lithosphere underpinning the Bighorn arch. Structural geology projects will center upon individual study regions situated along the study transects. Geophysics projects will involve seismology data interpretation or subsurface exploration of faults using gravity or magnetics in the field. All students will participate in seismology data collection using instrument sensors called ‘Texans’, which collect seismic signals that to be used to image the crust-mantle boundary (Moho) and faults within the crust. The seismic experiment will involve “active sources,” meaning that seismic energy will be generated from detonation of explosives. All of the participants’ results will be brought together within balanced two-dimensional models along the transects that will be used to evaluate the competing hypotheses for the lithospheric scale structure of the Bighorn range. The mechanism for the formation of mountain ranges within continental interiors, far from tectonic boundaries where differential motion between plates causes focused crustal deformation, is in many respects just as mystifying today in the 21st century as when Plate Tectonic Theory became the accepted unifying model for geological processes on Earth in the 1960s (Oreskes and LeGrand, 2005). In many respects, the foundations of geological knowledge of foreland mountain ranges comes from the Rocky Mountains of the western U.S.A. (e.g. Coney, 1976), and particularly the ranges of the state of Wyoming where the term “Laramide Orogeny” originated. The structural geology of the Laramide mountain ranges is world-renowned because of the aesthetic folded form of sedimentary cover rocks upon faulted Precambrian crystalline basement (Figure 1) which poses interesting mechanical problems. Comparable features that are distant from plate boundaries are now recognized in central Asia, far to the north of the Himalayan orogen (e.g. Scharer et al., 2004); in central Europe outside of the Alps (Marotta and Sabadini, 2003); and also in the well known “sister” system to the Laramide, the Sierras Pampeanas of Argentina (Jordan and Allmendinger, 1986; Cristallini et al., 2004, and refs cited therein). The Laramide Orogeny in the Rocky Mountains produced regional-scale anticlines, or arches, (Figs. 3,4) that are cored by Precambrian plutonic and/or metamorphic rock. The Phanerozoic platform sedimentary sequence of carbonate and clastic units defines the fold structures, showing that the arches may be asymmetrical and thrust-bounded (e.g. Fig. 4; east-central Bighorn arch, Stone, 2003) or symmetrical, with smaller outward- and inward-directed thrusts on both sides of the basement block (e.g., north and south ends of the Bighorn Arch; e.g. Hallberg et al., 1999). The differing structural geometries may be used to determine the nature of concealed fault/fold relationships at depth, for example whether deformation occurred upon rotational fault-bend folds vs. detachment folds (Erslev, 1986; Stanton and Erslev, 2004). Even with excellent surface and near-surface structural and industry data, the crustal structure of the Bighorn arch is known to depths of just 10 km (Fig. 4). Three pairs of two students will conduct ground traverses across the Bighorn range to acquire systematic fault and fracture data for the lithological units at all stratigraphic levels. One student in each team will have primary responsibility for the west side of the structural arch, and one, the east side; and each will alternate having a “lead” or an “assistant” role. The contrasting geometries of the opposing flanks will ensure that each member of a pair will attain a ‘different’ solution from the other. The contrasting exposures and structural segmentation between fault blocks (north, central, south) will mean emphasis of the work is on field structural data measurement, followed by computer-based data compilation and stereographic analysis for kinematic interpretation. The fracture kinematic data will be used for detailed structural balancing of the fold and fault structures in the cover rocks. The task of balancing will help students determine whether deformation of successive stratigraphic units and in different regions of the Bighorn range occurred in response to a) regional shortening (expected to yield sub-parallel strain axes throughout, as is the assumption for 2D profiles such as the one by Stone, 2003 in Fig. 4), b) localized strike-slip accommodation (expressed as strike-slip faults extending throught the axis of the arch), c) gravitational sliding (sliding radial to the arch) or ‘relaxation’ in a direction opposite to Laramide shortening). By sampling pre-, syn-, and post-orogenic strata, fracture timing will be established, resolving an active debate as to the origins of fractures in the region (e.g. Hallberg et al., 1999 vs. Stanton and Erslev, 2004). The transects will cross the southern, central and northern range crests, making use of US Highways 14 and 16 and forest roads for access (Fig. 3). Standard geometrical and kinematic methods (e.g. Marrett and Allmendinger, 1990) will be used to distinguish components of regional shortening, expected to be uniform in trend, from gravitational components expected to be radial to the arch, and from and strike-slip components along zones of structural transfer. The work will produce slip trajectories for range blocks be used to restore the arch in 3D. The projects will involve sampling for thin section analysis of brittle microstructures for determination of deformation mechanisms, qualitative depth estimates, and possible thermochronology of fault materials (using adularia; illite; apatite). Students involved in structure transects will also participate in the installation of instruments for the contemporaneous seismic experiments, and each student pair will work with one member of the “lithosphere group” (see below) who has primary responsibility for seismic analysis for the region surrounding their transect. In this way, members of the “crustal structure group” will gain experience with seismological methods. What is the pattern of Laramide slip across the Bighorn Arch that will need to be restored in EarthScope earth models? What are the age and mechanisms of the extensional fractures which are so critical to regional petroleum exploration and development? What is the role of gravitational spreading and arch-axis-parallel extension during the formation of basement-core foreland arches? What is the role of basement weaknesses in the localization of subsequent Laramide deformation? What field evidence exists for rotations about vertical versus horizontal axes, and what contemporary perspective can we gain from examining the historical development of thought on the process of arch formation? Three geophysics-oriented projects will involve analysis of data from the broadband passive source seismic experiment begun in 2009. The aim is to determine the depth and spatial extent of the crust-mantle boundary (Moho) beneath the Bighorns and/or major mid-crustal faults. Data from 2007-8 USArray stations (http://www.iris.edu/gmap?xmlref=http://www.iris.edu/earthscope/usarray/_US-TA-OpStationList.xml) will be used for lower resolution coverage of the surrounding region. In the field, students will take part in installation and data collection for instruments used in the hybrid active-passive seismic experiment. During the project, as many as 1800 seismometers at a time will record active source shots as well as background seismic sources such as teleseisms, local earthquakes, mine blasts, and ambient noise. The “people power” to be contributed by the Keck party of 12 people is needed! The instruments will be installed at intervals along three parallel SW-NE trending lines and two cross-cutting NW-SE trending lines. A portable laboratory of laptop computers will accompany the project group to the field area, and the “Lithosphere Group” will begin work with seismic data sets that have been collected prior to the group’s arrival in the Bighorns, under the instruction of Megan Anderson (Keck project faculty member) and graduate students who are working with her. Once their initial training is complete, the Keck students will also be involved in preliminary analysis of active source lines of seismic data as the data is collected during the project. Thus, students in this group will gain practical experience with instrumentation and deployment, even as their computer analysis of new data sets proceeds throughout the month of work in the field area. In addition, students doing seismology projects will participate in field study and measurement of selected faults and fracture arrays in the field, in order to broaden their own skill set and to gain close familiarity with the work of the Crustal Structure group. 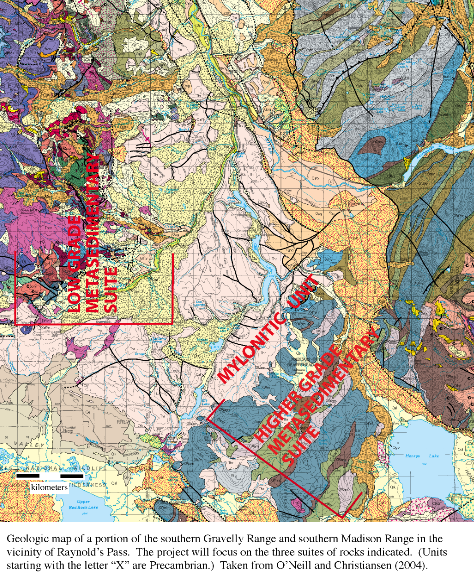 What is the depth of the Moho underneath and flanking the Bighorns Mountain range? How do faults located by structural studies extend into the subsurface as constrained by seismic reflectors in the active-source data? Are there any strong mid-lower crustal structual boundaries that may be connected to faults located by structural and active source studies? What is the deformational mode (e.g. pure shear, decollement) of the mantle as it is shortened along with the crust? 1 project: conduct a gravity survey across selected faults in the Bighorn range to assess upper crustal properties and the character and geometry of brittle faults in the upper crust. Recommended for a student with mathematics and physics background who wishes to conduct geophysical studies at the crustal scale (as could be relevant for a student who anticipates future specialization in mineral exploration or geohydrology). 1 or 2 projects: Compile surface measurements within a GIS of a part of the Bighorn range, and incorporate existing geological data from wells and industry sources. Successive layers of lithological units will be constructed as “sheets” at a deepest to highest levels contribute to the range-scale 3D crustal model of the Bighorns. Suitable for students with computer science and graphic representation experience. The project will begin and end at Colorado College. The CC Geology Department will provide vehicles and field equipment (including geophysical instrumentation) to support the work. The project will conclude with three days of sample preparation and seismic data analysis, during which time students will write a progress report and research plan for continuing their studies at their home campus. While in the field, accommodations will be in bunkhouses at the Iowa State University field station in Shell, Wyoming, and rental houses in Buffalo or Sheridan, Wyoming. Meal preparation will be undertaken by group members, on a rotating basis, using civilized kitchen facilities in the accommodations. There will be opportunities for backpacking/camping in the backcountry while doing traverses of 3 to 4 days duration (in the company of a faculty member). Students need to be equipped with their own tents, sleeping bags, and suitable clothing for a range of weather conditions. Students should be prepared for alpine terrain and weather conditions at elevations of 9000 to >12,000 feet (ever with the possibility of snow), as well as arid, hot environments of the Bighorn Basin. Potential hazards are precipitous cliffs, enraged moose or bear (if startled), rattlesnakes, mosquitoes, and recreational ATVs (on the 4th of July). Structural geology, Tectonics, Introductory Physics, and Geology field camp. Introductory Geophysics recommended for students who wish to undertake seismology, gravity, or magnetics research.